If we lost/forgot the password of the only administrator account, you cannot retrieve the original password. However you have the option to recover it by changing the password for which you need to to power cycle all fabric interconnects (FI) in a Cisco UCS domain. In the Navigation pane, click the Equipment tab. In the Equipment tab, expand Equipment > Fabric Interconnects. Click the fabric interconnect for which you want to identify the role. In the Work pane, click the General tab. In the General tab, click the down arrows on the High Availability Details bar to expand that area. View the Leadership field to determine whether the fabric interconnect is the primary or subordinate. You can use the following procedure to verify the firmware versions on all fabric interconnects in a Cisco UCS domain. You can verify the firmware for a single fabric interconnect through the Installed Firmware tab for that fabric interconnect. In the Equipment tab, click the Equipment node. In the Work pane, click the Firmware Management tab. This procedure will help you to recover the password that you set for the admin account when you performed an initial system setup on the fabric interconnect. The admin account is the system administrator or superuser account. Turn off the power to the fabric interconnect. Turn on the power to the fabric interconnect. You may need to press the selected key combination multiple times before your screen displays the loader prompt. Boot the kernel firmware version on the fabric interconnect. Choose a strong password that includes at least one capital letter and one number. The password cannot be blank. The new password displays in clear text mode. Exit config terminal mode and return to the boot prompt. Boot the system firmware version on the fabric interconnect. After the system image loads, log in to Cisco UCS Manager. This procedure will help you to recover the password that you set for the admin account when you performed an initial system setup on the fabric interconnects. The admin account is the system administrator or superuser account. Physically connect a console port on one of the fabric interconnects to a computer terminal or console server. For the subordinate fabric interconnect. Boot the kernel firmware version on the primary fabric interconnect. Boot the system firmware version on the primary fabric interconnect. Boot the kernel firmware version on the subordinate fabric interconnect. Boot the system firmware version on the subordinate fabric interconnect. This entry was posted in Cisco UCS and tagged How to recover the only administrator account for Cisco UCS Manager. Step 1: Open both DIMM connector latches. Step 2: Press the DIMM into its slot evenly on both ends until it clicks into place. DIMMs are keyed, if a gentle force is not sufficient, make sure the notch on the DIMM is correctly aligned. Note: Be sure that the notch in the DIMM aligns with the slot. If the notch is misaligned you may damage the DIMM, the slot, or both. Step 3: Press the DIMM connector latches inward slightly to seat them fully. Cisco does not support third-party memory DIMMs, and in some cases their use may irreparably damage the server and require an RMA and down time. The blade server contains 24 DIMM slots—12 for each CPU. Each set of 12 DIMM slots is arranged into four channels, where each channel has three DIMMs. Each channel is identified by a letter—A, B, C, D for CPU1, and E, F, G, H for CPU 2. Each DIMM slot is numbered 0, 1, or 2. Note that each DIMM slot 0 is blue, each slot 1 is black, and each slot 2 is off-white or beige. 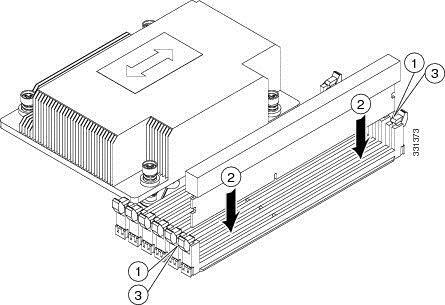 The figure below shows how DIMMs and channels are physically laid out on the blade server. The DIMM slots in the upper and lower right are associated with the second CPU (CPU shown on right in the diagram), while the DIMM slots in the upper and lower left are associated with the first CPU (CPU shown on left). This entry was posted in Cisco UCS and tagged Cisco UCS B200 M3 Blade Server, How to install a memory on a Cisco UCS B200 M3, Installing Memory, Installing RAM, Memory Upgrade. FlexPod Data Center was developed for large enterprises. FlexPod Express serves small and medium-sized enterprises. FlexPod Select focuses on high capacity and performance for specialized workloads. Cisco and NetApp support FlexPod deployments through the Cooperative Support Model. FlexPod components include Cisco Unified Computing System (Cisco UCS)servers, Cisco Nexus switches, and NetApp unified storage systems. The FlexPod architecture can scale up or out. And it can be optimized for a variety of mixed workloads in both virtualized and nonvirtualized environments. Large enterprise data centers need agile platforms with high availability and scalable storage. Along with reducing operating costs, chief information officers want to use a converged infrastructure to support hybrid cloud computing. Small and medium-sized enterprises need a simplified setup and easy use, access to public cloud services, and greater value for their data center budgets. Many enterprises also need purpose-built, high-capacity platforms for specialized workloads. Large-scale, real-time data analytics place unique demands on computing stacks. Video surveillance, in-memory databases, and public cloud infrastructures have similar capacity needs. FlexPod’s architecture can be configured for the growing needs of all these clients. FlexPod is deployed with more than 4100 customers and available in more than 100 countries. For the future, FlexPod customers and partners want configuration guidance, easy ordering, and validation for the configuration that is most aligned with their needs. Cisco and NetApp support FlexPod through a Cooperative Support Model, receive best in class experience from NetApp, Cisco and our ecosystem partners delivered through collaborative and coordinated support services for your FlexPod integrated infrastructure. FlexPod benefits from integrated management in the form of Cisco UCS Director.UCS Director supports cohesive, flexible data centers, built on FlexPod, that increase IT and business agility, while reducing operational processes and expenses. An overview of the FlexPod solution is available through an iPad app. FlexPod’s architectural flexibility is underpinned by a series of Cisco Validated Designs. These guides cover the important areas of the FlexPod infrastructure, applications on FlexPod, and security. A more complete listing is available on the Data Center Case Studies. This entry was posted in Cisco UCS, FlexPod and tagged Cisco UCS Manager, FlexPod, UCS commands. The Cisco NIC Teaming Driver is contained in the UCS-related Windows Utilities ISO. You can download it from http://www.cisco.com. Depending on your platform, choose either Cisco UCS B-Series Blade Server Software or Cisco UCS C-Series Rack-Mount UCS-Managed Server Software. Once you have installed Windows on the blade you can proceed to install the teaming software. First let us see how to install the NIC teaming driver on the server. Step 1 In Windows, open a command prompt with administrator privileges. Once the driver is installed, you need to configure the teaming on the desired NICs. C:\> enictool -d "Local Area Connection" "Local Area Connection 2"
Step 4 To view additional options and usage information, enter enictool /?Use the displayed command option information to configure load balancing method, load balancing hash method, and other options. This entry was posted in Cisco UCS, Windows and tagged How to install NIC Teaming Driver and configure NIC Teaming in a Cisco UCS B200-M3. The solution posted is to rollback to Update 25. Rolling back to Update 40 also works. This entry was posted in Cisco UCS and tagged UCS console does not open, UCSM login problems with the Java 7 Update 45. The 640-911 DCICN “Introducing Cisco Data Center Networking” is one of the exams associated with the CCNA® Data Center certification. This 90-minute 65−75 questions exam tests a candidate’s knowledge of networking concepts for the Data Center environment, based on Nexus-OS. You will learn fundamental information on how a Data Center network works; and how to configure virtualization in the network, addressing schemes, troubleshooting and configuration skills. Candidates can prepare for this exam by taking the course 640-911 DCICN, “Introducing Cisco Data Center Networking”. The Study/Learn tabs for the 640-911 DCICN Exam page. This entry was posted in Certifications, Cisco UCS and tagged cisco ucs certifications. This entry was posted in Cisco UCS and tagged UCS commands.